I am an online private tutor for Maths. I have been teaching since 2004. 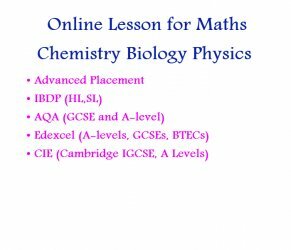 I teach online and one to one lesson for higher secondary level AP Calculus AB BC. To make the whole lesson into simple steps. Make a lesson interactive and fruitful. Each lesson applicable to daily life. Implemented knowledge of mathematics which leads to understands. Student's succeeding in exams depends on their own self efforts. The student's self-efforts and daily practice of Maths sums is vital. Students have to take self-efforts to do homework. Students have online lessons at their own home, university or college. This ultimately leads to succeeding in exam. Preparation test: SAT, ACT, GRE, and GMAT. Math: ACT Math, algebra 1, algebra 2, calculus, geometry, pre-algebra, pre-calculus, SAT math, trigonometry, ACT Math and Vedic Maths etc. Olympiad Exam Preparation (Maths Olympiad and Scholarship Exams). Undergraduate: MTH 161 (Calculus I).Maths (1111), (College Algebra) and Math 0099-Intermediate Algebra for university students. Vedic Maths for level one, two, and three for all ages of people. I have always enjoyed helping students make sense of things. I have students from all around the world. I have students from the India, UAE, Canada, Indonesia, USA, UK, and Netherlands for online tutoring. I teach Math for University of Miami, University of Toronto. I also teach Maths for The International Baccalaureate (IB) Diploma Programme (HL SL), Advanced Placement (AP BC), Cambridge AS and A level and Edxcel and AQA A level and IGCSE Maths etc.